Sterling silver History of Ireland pendant features a necklet style design. This History of Ireland necklace is a heavy 16” long sterling silver necklet that is fashioned in the Tiffany style. The History of Ireland icons are engraved on the 1" wide x 3/4" tall oval charm and it is gift boxed with the legend booklet that explains the symbol. 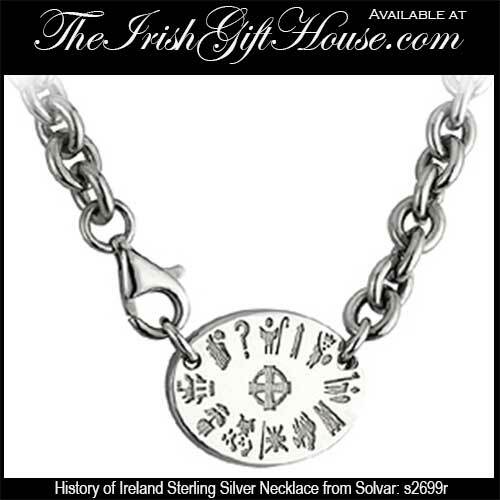 History of Ireland jewelry is made by Solvar in Dublin, Ireland; it is available at The Irish Gift House. Sterling silver History of Ireland necklace is a bar style necklet with a double sided design.